What are you asking the attorney general of New York to do? What does it mean to revoke a corporate charter? What are the grounds for corporate charter revocation in New York? What happens to a corporation that is judicially dissolved? Which corporation are you asking the New York Attorney General to dissolve? What are the grounds for dissolution? How does this relate to litigation against President Trump, or impeachment efforts? Does the attorney general need the permission of the New York Legislature, Congress, or the federal government to bring this action? Would dissolution of the Trump Organization end the President’s impeachable conflicts of interest? What steps can the attorney general take to ensure that dissolution of the Trump Organization does not harm innocent workers or vendors? How do you think the attorney general will respond to your request? We are asking New York Attorney General Letitia James to investigate whether to bring proceedings to dissolve and revoke the charter of The Trump Organization, Inc. under Section 1101 of the New York Business Corporation Law. The letter was submitted by Free Speech For People, a national non-partisan, non-profit 501(c)(3) organization; Jonathan S. Abady and Andrew G. Celli, Jr., of Emery Celli Brinckerhoff & Abady LLP; Ben T. Clements, of Clements Pineault LLP; Professor Jed Shugerman of Fordham University School of Law; and Professor Jennifer Taub of Vermont Law School. Corporations are created by state law when the state government issues a corporate charter. A corporate charter provides special benefits that are not available to citizens, such as limited liability and perpetual life. In general, grant of these privileges through a corporate charter serves the public interest because corporations promote economic growth. But in virtually every state, corporate charters are conditioned on good behavior. For this reason, state laws have long authorized state officials to revoke the charters of corporations that exceed or abuse their legal authority. For more background on corporate charter revocation in general, see this short educational video: http://bit.ly/corpcharter. Yes, the attorney general has used this authority for more than a century. For example, in 1994, the attorney general successfully brought suit to compel the judicial dissolution of a for-profit business school network that “had conducted its business in a persistently illegal manner and contrary to public policy.” And in June 2018, Attorney General Underwood filed a lawsuit under a related provision (applicable to non-profit corporations) to compel the judicial dissolution of the Trump Foundation. Our request asks the attorney general to investigate whether to file an action for judicial dissolution of The Trump Organization, Inc., a New York business corporation (DOS ID# 694908, filed Apr. 23, 1981) with its principal office at 725 Fifth Ave, 26th floor, New York, New York. The term “Trump Organization” is also commonly used to refer to embrace a separate LLC, Trump Organization LLC (DOS ID# 2405651, filed Aug. 4, 1999), and some 500 distinct but affiliated entities, including both corporations and LLCs. While the precise internal relationships among these entities can be opaque, it appears that Trump Organization corporate headquarters—which has, according to the New York Times, “just a few dozen employees,” several of them family members—exercises management and control over the various entities created to own or operate specific business projects. For example, the New York attorney general made this exact argument to explain why The Trump Organization, Inc. is liable for violations of law by Trump University, a separate LLC. This request asks the attorney general to investigate whether to file an action under Section 1101 of the Business Corporation Law to dissolve The Trump Organization, Inc. It may also become necessary to expand the investigation to include additional Trump business entities. There are two separate grounds for dissolving the Trump Organization, which are laid out in detail in our letter. First, by continuing to operate under Trump family ownership and control with President Trump in the White House, the Trump Organization flagrantly abuses its state-granted powers, contrary to the public policies of New York State against corruption and conflicts of interest, and contrary to the U.S. Constitution, including violations of the Foreign Emoluments Clause and the Domestic Emoluments Clause. The Trump Organization had more than enough opportunity to remedy these problems. On November 30, 2016, the United States Office of Government Ethics announced that the “[o]nly way to resolve these conflicts of interest is to divest.” The nearly ten-week transition period between the presidential election and the presidential inauguration gave Mr. Trump sufficient opportunity to sell or otherwise divest all conflict-producing interests in the Trump Organization in numerous ways. He could have liquidated the business and invested the proceeds in a diversified mutual fund or a true blind trust; initiated non-judicial dissolution under article 10 of the Business Corporation Law; or petitioned the court for judicial dissolution on behalf of directors and/or shareholders under article 11. But despite every opportunity, the Trump Organization did not do anything remotely adequate to address these serious concerns. Instead, on January 11, 2017, the Trump Organization’s tax law firm announced a plan to transfer management control of the Trump Organization to Mr. Trump’s sons and a senior executive, without eliminating Mr. Trump’s ownership stake. Instead, as the New York Times reports, Mr. Trump’s ownership stakes have been transferred from Mr. Trump personally to “The Donald J. Trump Revocable Trust,” a trust formed “to hold assets for the ‘exclusive benefit’ of the president” and which uses Mr. Trump’s Social Security number as its taxpayer identification number. The law firm also announced a plan to “voluntarily donate all profits from foreign government payments made to his hotel to the United States Treasury.” But the Trump Organization soon watered down that pledge. In response to a congressional inquiry, the company claimed that it would be “impractical” to “fully and completely identify” all foreign government customers and that it would “impede upon personal privacy and diminish the guest experience of our brand.” Furthermore, the Trump Organization decided that, even for self-identified foreign government patrons, the company would not calculate actual profits, because its pledge was “not practical” and compliance would require “time, resources, and specialists.” Instead, the Trump Organization decided simply to estimate costs. In any event, the Foreign Emoluments Clause does not provide an exception for receiving foreign emoluments, deducting operating costs, and then donating the “profits” to the United States, and even if it did, the plan does not remedy the serious constitutional and ethical violations that go beyond “profits” at one particular hotel. Second, apart from facilitating unconstitutional emoluments to the president from foreign governments and others, the Trump Organization has a history of alleged illegal, fraudulent, or abusive activity demonstrating that it has exceeded the authority conferred upon it by law and carried on its business in a persistently fraudulent or illegal manner. The scope of alleged illegal, fraudulent, or abusive conduct by the Trump Organization and business ventures under its umbrella is broad, and has been catalogued in detail elsewhere. Our correspondence lists examples ranging from racial discrimination in housing, fraud against customers and investors, labor law,campaign finance law, the Foreign Corrupt Practices Act, and the Iran Sanctions Act. Furthermore, the company’s history, and that of its namesake, give every reason to expect that illegal activities will increase, not decrease, the longer that President Trump remains in the White House. Indeed, on August 21, 2018, Michael Cohen—until 2017 an executive vice president at the Trump Organization—pleaded guilty to eight federal criminal charges, one of which directly implicated the Trump Organization. The criminal information details how the Trump Organization conspired to violate federal campaign finance law and evade regulatory scrutiny through a fraudulent scheme of concealing “hush money” payments and campaign expenses over the course of 2017. As explained in our letter, the Trump Organization conspired with Cohen to violate federal campaign finance law by concealing illegal campaign contributions as supposed payment for non-existent legal services. These are parallel and complementary, but distinct. This letter asks the attorney general of New York to exercise power granted to her by the people and legislature of New York to reassert control over a corporation created under state authority. The impeachment campaign asks Congress to initiate proceedings to remove President Trump from office. No. The people and legislature of New York have vested the attorney general of New York with the authority to bring an action to dissolve a corporation on the grounds stated in the New York Business Corporation Law, and the courts of New York to decide such an action. That determination would need to be made by the U.S. House of Representatives. 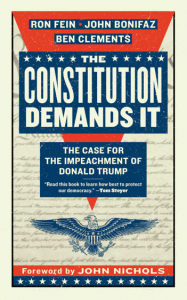 Free Speech for People has already launched, with RootsAction, a campaign for an impeachment investigation in Congress to determine whether impeachable violations have occurred. If the House concludes that the Trump Organization has been involved in impeachable violations committed by the President, then the President would still need to be held accountable for these violations, independently from New York state proceedings to revoke the company’s corporate charter. As noted above, New York law provides for an orderly process to dissolve a corporation under court supervision, to minimize that type of disruption. Dissolving The Trump Organization, Inc. would not require office buildings, hotels, or golf courses in New York or other states to close or lay off employees or write down bills. Indeed, the fact that most of these businesses are structured as separate corporations or LLCs would make dissolution of the Trump Organization easier than in many other cases. Working with a court-appointed receiver, the attorney general can develop a plan to ensure that these businesses can continue to operate and pay their staff and vendors while dissolution of The Trump Organization, Inc. is pending in court, and allow for successful operation afterwards. We are confident that the attorney general will give this matter careful consideration and come to the same conclusions we did.